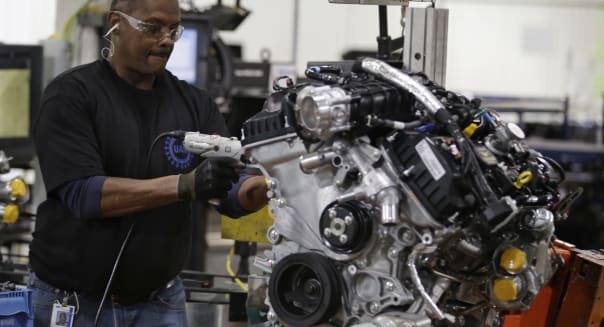 NEW YORK -- U.S. manufacturing activity slowed in March after nearing a four-year high last month, but the rate of growth and the pace of hiring remained strong, an industry report showed Monday. Financial data firm Markit said its "flash" or preliminary U.S. Manufacturing Purchasing Managers Index slipped to 55.5 from 57.1 in February. Readings above 50 indicate expansion. That fell short of economists' expected reading of 56.5 but was still comfortably ahead of 53.7 in January, suggesting the effects of a harsh winter have started to fade. The new orders component fell to 58 from 59.6 in February, partly the result of a decline in overseas demand, Markit said. %VIRTUAL-article-sponsoredlinks%Output edged down to 57.5 from 57.8 while firms took on workers for a ninth consecutive month. The survey "adds to evidence that the sector has shrugged off the weather-related weakness seen earlier in the year," said Markit chief economist Chris Williamson, adding the still solid showings for output and new orders was "encouraging news." Most economists expect the harsh winter that enveloped much of the country in January and February have put the brakes on first-quarter growth. The U.S. economy grew at a 2.3 percent rate in the final four months of 2013. Williamson said recent trends in manufacturing -- a roughly 4 percent annualized growth rate and about 10,000 to 15,000 new jobs per month -- will nonetheless boost overall U.S. growth. Markit's flash reading is based on replies from about 85 percent of the U.S. manufacturers surveyed.